On March 15, 2018, the Syrian armed conflict entered into its eighth year. Since 2011, attempts to facilitate a political solution to the Syrian conflict have either failed or stalled. Amidst this deadlock, one track that has not stalled is the civil society track. Against the odds, progress can be observed at this level as Syrian civil society has become better organized and more tightly interconnected, and as its voice in the process has grown stronger. The Civil Society Support Room (CSSR), set up by Staffan de Mistura, chief UN mediator for Syria, is helping to bring civil society activists together so that they can be better incorporated into the peace talks. The Civil Society Support Room (CSSR) is an initiative by the UN that provides a space for civil society inclusion during Syrian peace talks, and could become a model for other peace processes to follow. The CSSR provides Syrian civil society a physical workspace at the UN headquarters in Geneva. The UN organizers have adopted a broad definition of civil society to avoid disqualifying relevant actors operating inside Syria in both opposition-held and government-controlled areas, as well as persons whose expertise would have otherwise been discounted due to their political past or current political leanings. Supporting local agency and representation during peace talks is crucial to the strength and longevity of the peace agreement. Sustainable peace is rarely achieved through outside parties dictating the terms of an agreement. Religious civil society actors can re-frame issues outside of the common conflict narrative. Civil society can use professional or religious associations to cut across the lines of conflict (horizontal capacity). Civil society leaders have access to top-level (political) leadership as well as their grassroots constituents (vertical capacity). Nongovernmental/civil society experts have a more complete, homogenous, understanding of conflict than politicians do–where political divisions lead to a greater number of viewpoints on conflict among government actors. When there is general consensus on the cause(s) of a conflict, governmental and nongovernmental actors can more accurately direct services and attention to resolve the conflict. “Against the Odds: Civil Society in the Intra-Syrian Talks”. By Sara Hellmüller and Marie-Joëlle Zahar for International Peace Institute. March 20, 2018. 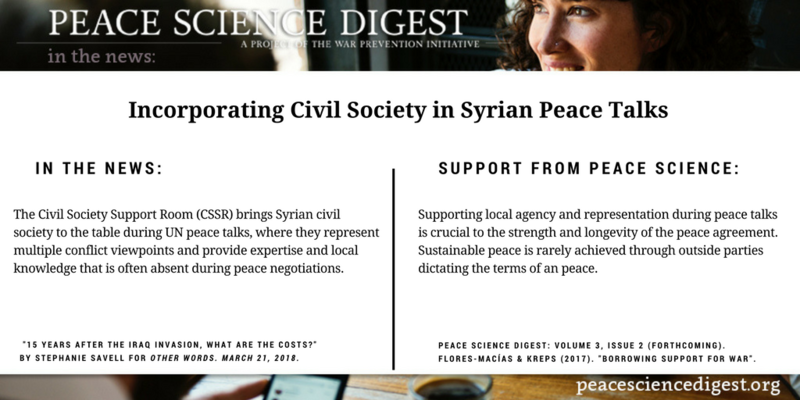 Peace Science Digest. Volume 2, Issue 5: “The Peacebuilding Role of Religious Civil Society Initiatives in the Korean Peninsula”; Volume 1, Issue 3: “Varying success of civil resistance in Colombia“; Volume 3, Issue 1: “How Experts and Politicians Understand Conflict Differently”.